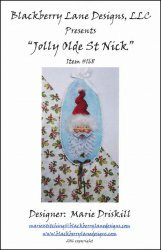 Jolly Olde St Nick Ornament [G1148] - $13.00 : Yarn Tree, Your wholesale source for cross stitch supplies. Cross stitch pattern by Blackberry Lane Designs. An ornament for Christmas featuring a happy Santa with holly in his beard. Stitch count 36w x 95h.